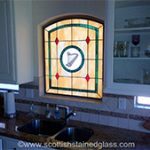 Scottish Stained Glass has completed dozens of projects for retail locations around the country. 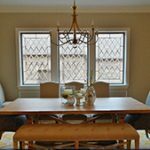 Our retail stained glass can be used as a beautiful, original center piece, as an extraordinary piece of detail work, and as functional, practical elements. 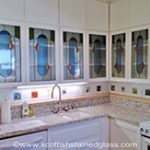 While most of our retail work has been completed in boutiques, individual locations, we can also complete stained glass projects for regional or national chains. 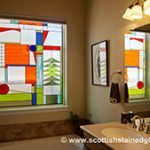 When it comes to retail, stained glass can be used in an infinite amount of ways and places. 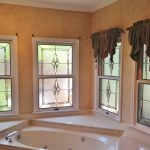 The installation of stained glass in retail locations can occur over existing windows, preventing the need for any sort of construction or mess. 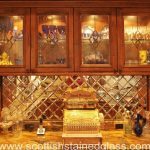 Behind the checkout counter is an ideal location to incorporate stained glass; it draws the eye and attention through the store and to the register. 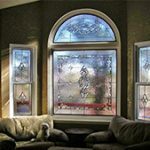 Stained glass designs can be installed in the ceiling, often creating unique and appealing light fixtures, and creating a focal point that will be remembered by your customers. Dressing rooms invite a lot of design opportunity within retail spaces as well. When you are trying on clothes you want to be in a comfortable but stylish atmosphere. 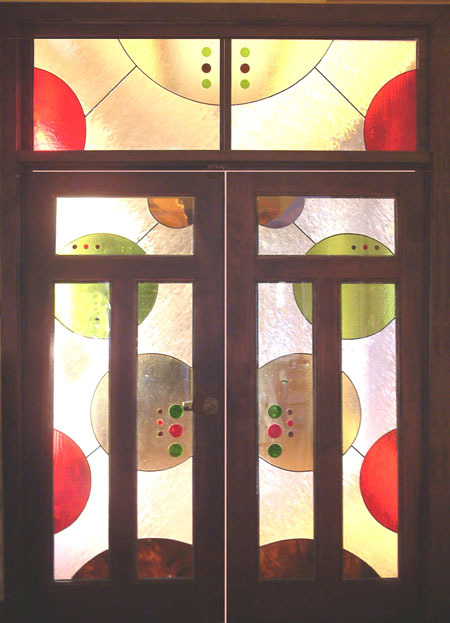 Dressing room doors can be adorned with stained glass because they add an artistic appeal but also create privacy. We can create dressing room doors that match the style and colors that you want incorporated into your store. 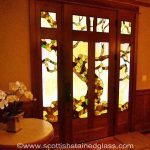 You might also think of adding stained glass to the front door of your retail space. We can create an inviting entryway for your business that will open up your store in a beautiful way. 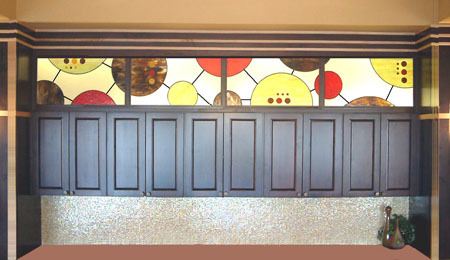 Having stained glass in your retail space does not mean it has to distract from the products. If you would prefer to have the glass be more of a detail, there are plenty of routes your store can take. 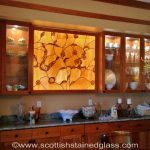 Counter fronts are another strong opportunity to showcase stained glass. 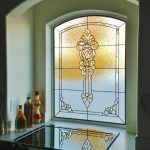 Since it is lower, it won’t be entirely distracting, but once you notice it the stained glass will make a lasting impression on your customers. 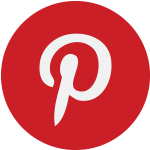 Get creative with your signage; stained or leaded glass can also be used to organize your store in a unexpected way. Creating stained glass signs within your retail space will create an upscale, elegant look for you location, setting your business apart from the others. If your retail location has a color scheme you wish to continue throughout the decor, we can match and accentuate it since all of our designs are custom. 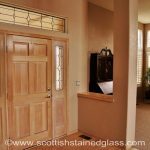 However, if you would prefer to have a more sleek and simple look, leaded glass is a wonderful option to consider. 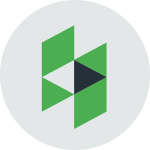 We specialize in many different styles, and since each piece is custom, we can accommodate any look and style of a business location. 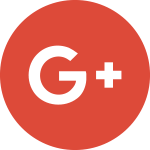 The quality of design in your retail location inevitably reflects the quality of your shop and products; show your customers you care about the details and that you know what good design is all about. 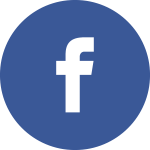 Contact us today to learn more about how our stained glass windows will work in your retail location.